I took Simon to a library program in our teeny-tiny town one day. We went through the door; he headed to the left, and I was pulled to the right–to shelves full of library sale books. I saw at least two full racks of picture books. I smiled as I saw familiar, beloved titles such as Miss Suzy and The Gardener. The library’s price was a measly twenty-five cents per book. I flipped through a few and noted spots where tots had crayoned as well as torn pages. I couldn’t let the books out of my hands, though. I knew these could be used for something. And that’s when I thought of the co-op class I was slotted to teach in the spring. One of the storytelling activities outlined in the book I had chosen to use for the class (Show Me a Story) was called Storyblocks. 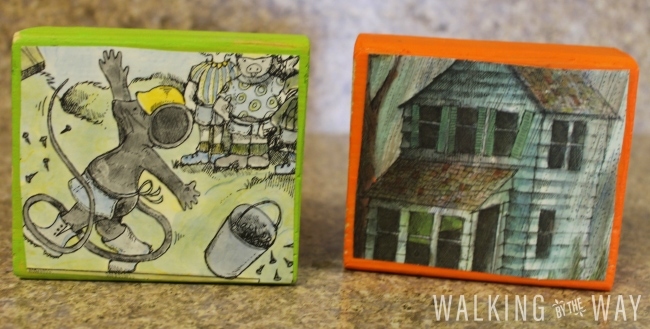 I decided to put a bit of a spin on the activity and recycle some great children’s picture books at the same time. 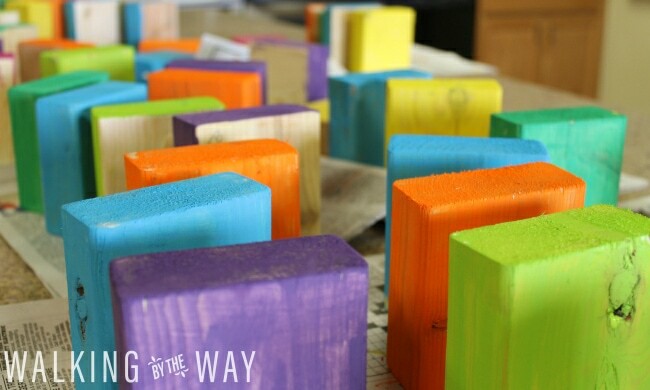 Give each student a piece of sandpaper and let them smooth out any rough parts on the blocks. We put acrylic paints in cups and gave each student a foam brush. As students would finish with one color, they would ask for another. Brushes traveled with the cups so we didn’t have to clean brushes. 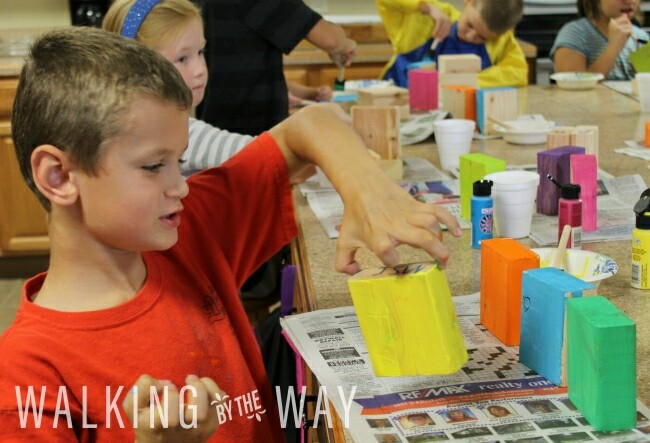 It took almost the entire class time to sand and paint the blocks. Half of the class was asked to bring in a favorite storybook to share. They simply told us the title of the book and why it was a favorite. We gave students were stacks of illustrations to choose from. Some traded with their neighbors so they could have a matching set of blocks. We gave the students square templates made out of card stock to help them cut right-sized squares from the illustrations. We added some Mod Podge to cups and gave each student a foam brush. I demonstrated how to coat and seal the illustrations and then the students completed the task. 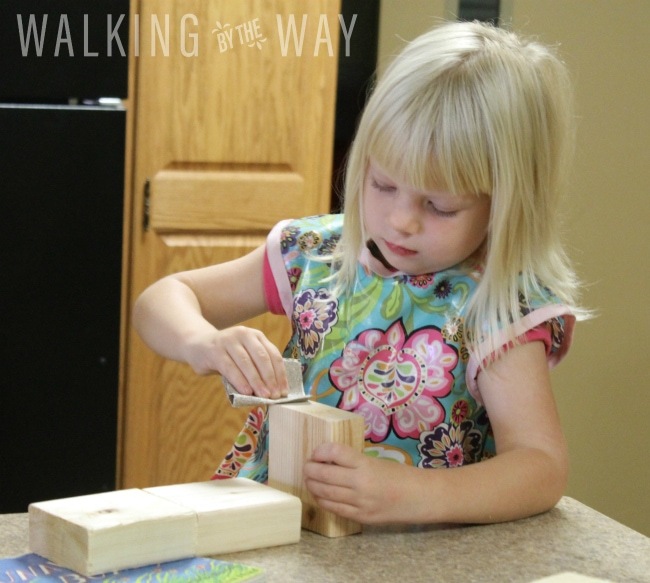 The students were able to take their blocks home after the next class. I also sent home instructions. Line up the blocks and tell a story. 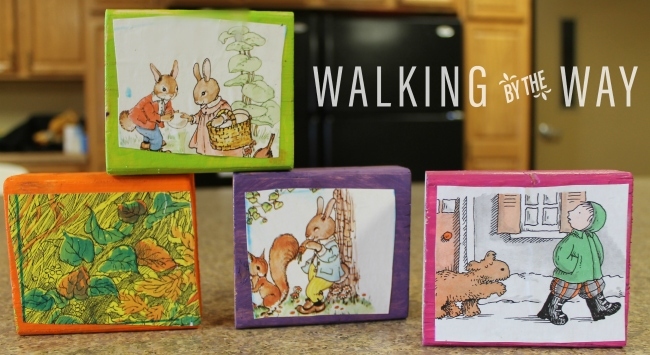 Rearrange the blocks and encourage your child to tell a different story with the same blocks. 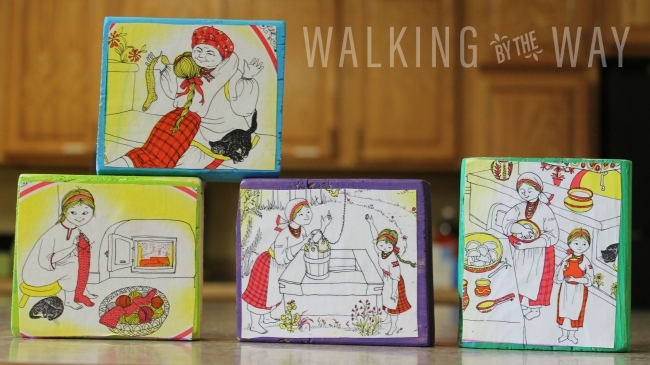 Set a few story blocks on a windowsill, dresser, or shelf. Add a stuffed animal or plastic toy. 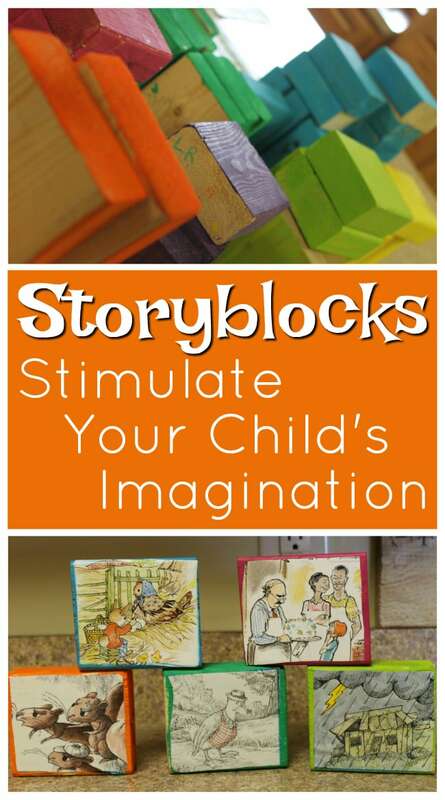 Use the blocks and props to tell a story! Add more pictures (or words cut out from magazines) to the backs of the blocks for more storytelling possibilities. Choose just one block and create an entire story from it. 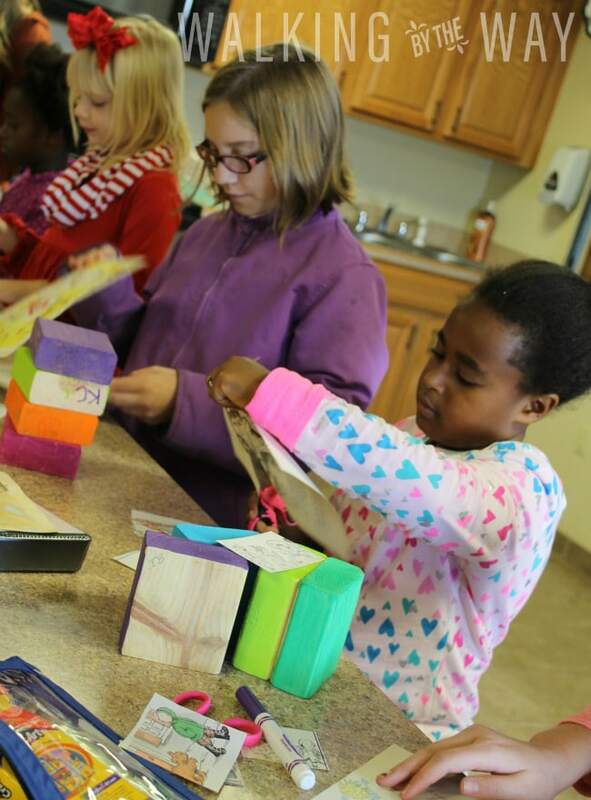 If you are looking for another hands-on storytelling activity, try mystery boxes! That is such a perfect idea! 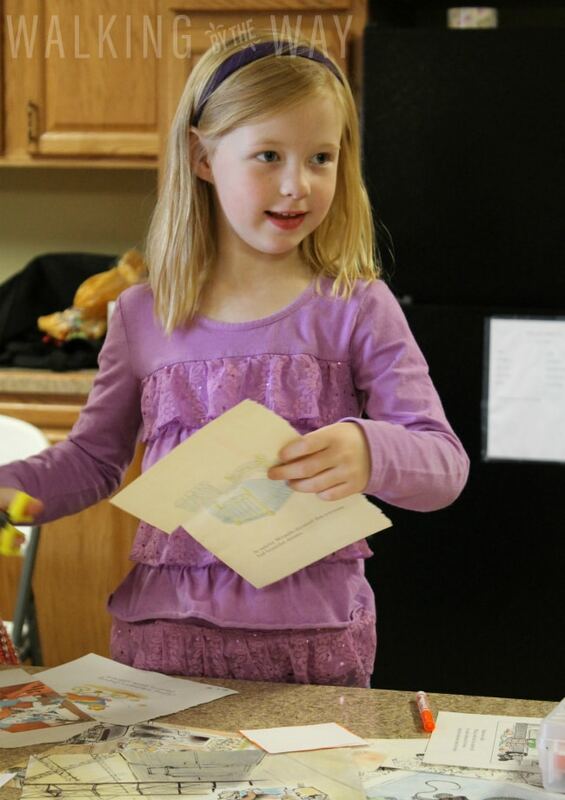 I teach preschoolers in our Mops group. They are perfect. I am getting discarded books together. That will such a great teaching aid! Thank you very much! Good activity for developing creative storytelling. We use story cubes in a similar way where there is a picture on each side. 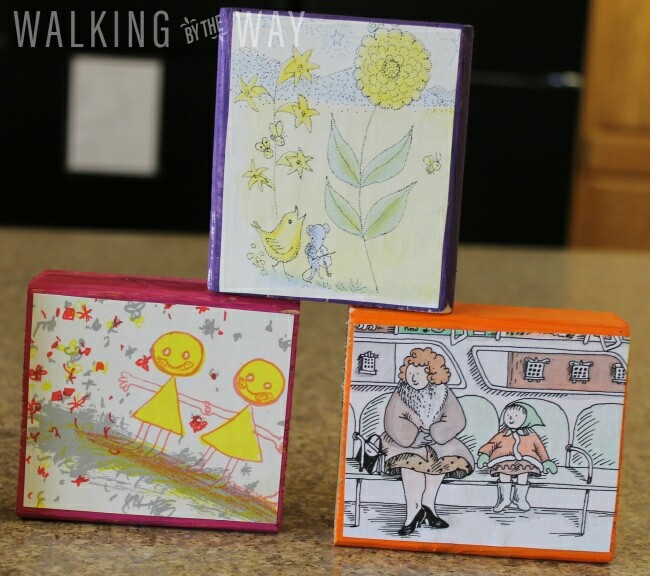 Throw them on the table and take turns telling a story with the pictures as a cue.